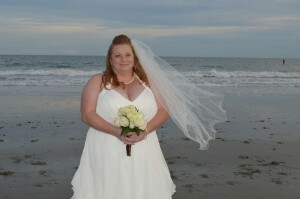 Holly Noela Aiken and James Albert Snow Jr. both of Springfield, MA were united in marriage on the beach at Wedding Chapel by the Sea in Myrtle Beach, South Carolina on November 8, 2014. The bride is the daughter of Paula Brooks and Raymond Aiken. The bride’s attendants were Cynthia Aiken, Patricia Davis, Janet Alston and Janae Snow all of Springfield. MA. Also Aiyana Richardson of Myrtle Beach, SC. The groom is the son of Sarah Snow. His attendants included Daniel Davis and Ja’zie Pearson of Springfield, MA; Sherman Richardson and Malcolm Richardson of Myrtle Beach, SC; and and David Green of Chicopee, MA. The bride holds an associate degree and is a registered nurse at Baystate Medical Center. The groom is a pasteurizer at a Milk Company. After a honeymoon in Myrtle Beach, SC the couple will reside in Chicopee, MA.